ZooBoing Illustrations offers a wide range of rendering/illustration styles. We can help you with preparing 2D and 3D illustrations. Scroll down to see a few examples, or click on the Gallery Link to see a wider range of our work. SketchUp Illustrations. One of the quickest/least expensive ways to understand your design. CAD details. CAD drawings can be prepared of the building for easy insertion into construction documents. These drawings can help your contractor understand the building quickly and help keep estimation fees in line. Colored Site Plans and/or Colored Elevations. We can take your CAD drawings and apply color, materials and shade to make a flat drawing have more depth and understanding. ZooBoing produces AutoCAD, Massing, Artistic, Sketch and Photo-Realistic illustrations to fit your schedule, budget requirements. Photo-Realistic renderings look like a photo, and make you feel like you are standing in that space. 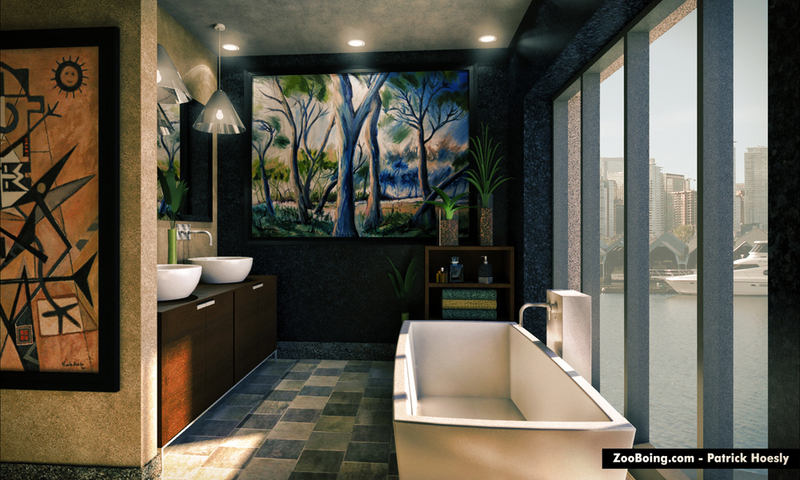 SketchUP style illustrations are accurate, depict real materials and lighting while keeping a looser feel. They are cheaper/faster to produce while still being able to accurately describe a space.